The Communion Veil: Communion on the Tongue..think about it! Communion on the Tongue..think about it! Audio of this Blog - Click Here. When we take Holy Communion (note the word "Holy") - do we think about what we are doing? Do we prepare for the most important act we can ever do in our entire lives? Yes, I said the MOST important act you can ever do in your entire life, greater than any stature you may attain or any choices that you make in life. You are taking into yourself, the Body, (Not bread - it is no longer bread, it is our Lord Jesus in the hidden form - but no less real.) Why do the Eucharistic miracles find the heart muscle when the Eucharist is examined? (See link at bottom of posting). Are we not taking His very heart into ourselves? It is His Blood - his true and real blood that He shed for love for us and now we take at Holy Mass. His soul...wow, that one gets me. A touching of His soul with ours which fail Him in so many ways, what love is this! And finally His Divinity... Stop...Repeat these words, "His...Divinity." Are you not taking the second person of the most Blessed Trinity into yourself? If we understood the gravity of just one small sin (not even mortal sin) that it should rightly condemn us to Hell for offending such a good and gracious God we would understand the breadth of God's mercy and His love for us. "What is man that God is mindful of him?" Psalm 8:4. And yet we who are sinners take our God into ourselves each time at Holy Mass. I'm not telling you to take Holy Communion on the tongue, nor am I telling you it is wrong to take it in the hand. I am just asking you to think about what you are doing. What is the last thing we do at Holy Mass before we go up to receive the Holy Eucharist? We shake hands, the sign of peace, which is great. But now you have to ask yourself, is my hand clean enough to take the Holy God into it? Maybe it is, maybe it isn't, you don't really know. In the end this is a personal matter between us and our Lord. All I'm saying is think about it, pray about it, ask the Lord what He wishes you to do. 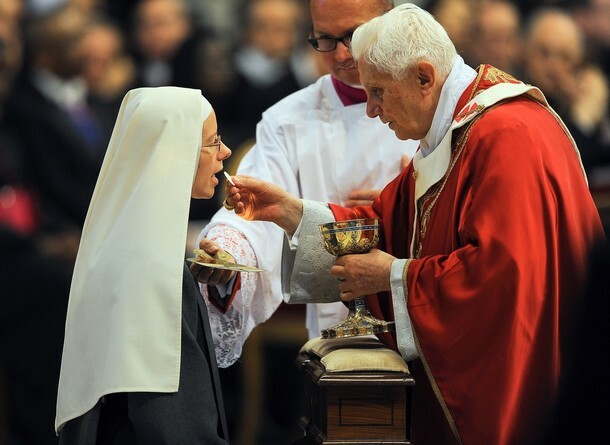 By all means do not let anything I say prevent you from receiving the Eucharist! Come and receive our Lord in the Eucharist by all means, preferably after a good confession. "Wherefore, my dearly beloved, as you have always obeyed, not as in my presence only, but much more now in my absence, with fear and trembling work out your salvation."